Last year for Easter I made these birds nest cupcakes. 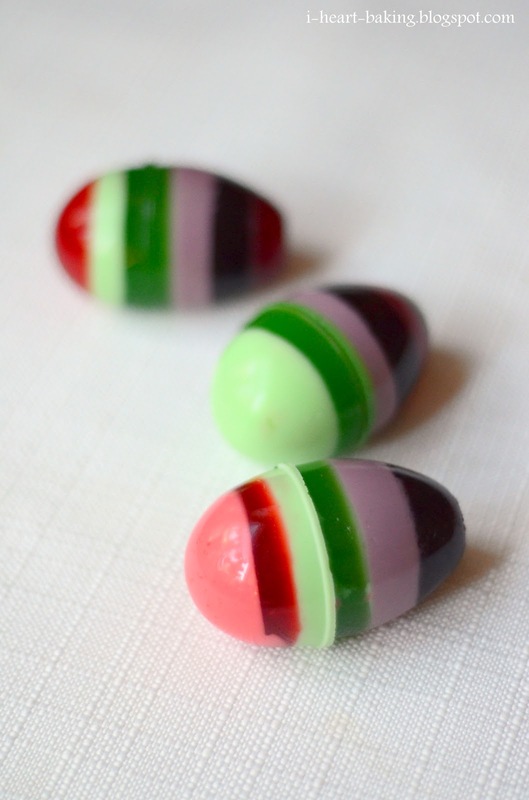 And this year, when I saw this blog post at Just a Taste on how to make a jello egg inside of a real egg shell, I was enamored with the idea, and I wanted to make layered jello eggs for Easter! I was already brainstorming in my head how I would do it, what I'd do with the leftover insides of the egg, what colors/flavors of jello I would use ... and then while I was at the grocery store later that week, I found this crazy gadget - it's specifically meant for making jello eggs! Best of all, it was free with the purchase of 3 boxes of jello! Score! 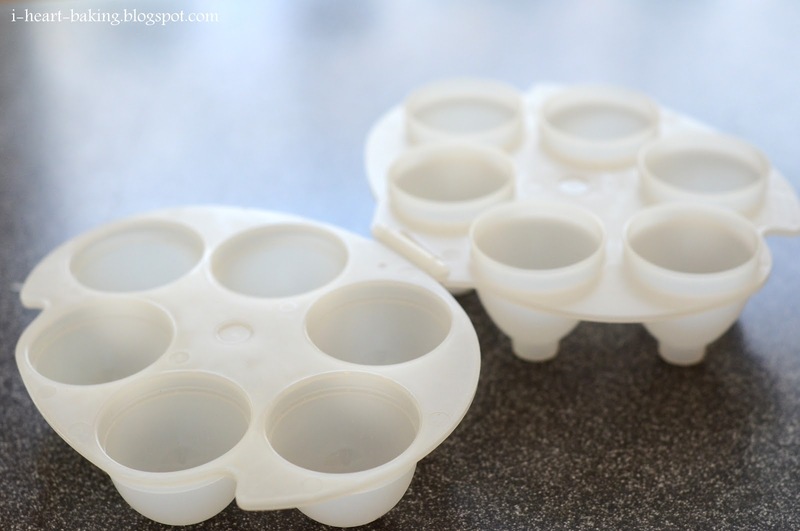 I practically skipped home with my new gadget, ready to make Easter jello. I had signed up to make jello for my daughter's daycare Easter party anyway, so I would just use some of the mixture to make my layered jello eggs. I decided that I wanted to make pastel layers in between the colors, instead of the white layers like I normally do. So I made my usual layer jello recipe, but for the pastel layers, I used the colored jello and replaced 1/2 cup of the water with heavy cream. The resulting pan jello for my daughter's daycare party turned out pretty, although it didn't exactly scream "Easter". Also it wasn't very tall since I only did six layers (instead of the usual seven), plus some of the jello mixture was subtracted to be used in my experiment with the jello eggs. 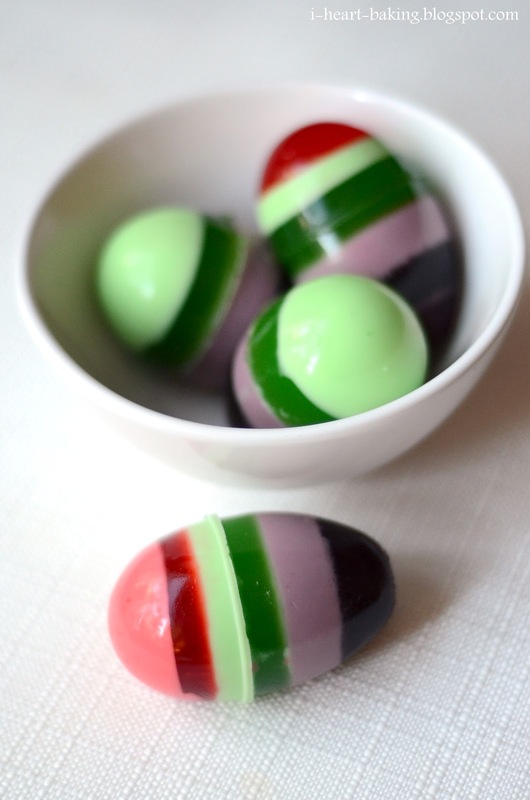 As for the layered jello eggs, they did not turn out so pretty. I must not have closed the two halves of the form all the way, because all of the eggs had an ugly seam all the way around the middle. Plus because I was experimenting with the order of the colors, they all turned out looking rather odd. But still cool because they're shaped like eggs! Next time I'll try solid colors instead, or maybe I'll just stick to using the white layers of jello in between the colors. I thought I had seen it all but this is a really fun idea!